The Make n Take was a total success. Melissa did a GREAT job. Looking for a GREAT dry embossing class-look no further Donna has classes every month!! Let us wish upon a star!! A good way to start your holiday cards, easy to put together. 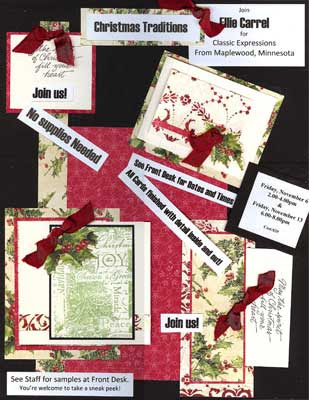 Join Ellie for this beautiful yet simple, elegant and traditional Christmas Card Class. Using colors of the season, of Christmas green and holly red, and beautiful ivory shimmer papers, you will create three cards. Hope to see you there! Glue Glider Back in stock!! Glue Glider Pro Adhesive Runner and refills back in stock!!! This great tool is perfect for card makers, paper crafters & scrapbookers; there are hundreds of uses for this fantastic tool! The Glue Glider pro comes with 1/4inch by 40feet of PermaTac Adhesive. Hope everyone had a fun and safe holiday!